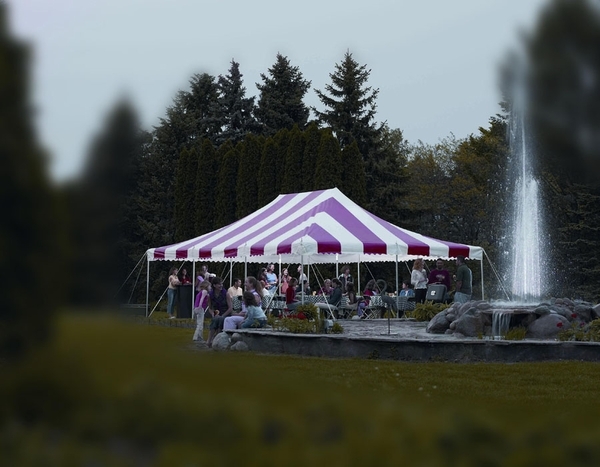 This Eureka Traditional Party Canopy with Solid Top - 20 Foot x 30 Foot features attached guy ropes and 'D' fillings and storm lines are positioned at all center poles. The anodized sectional aluminum center poles and 7 in. side poles offer strength as well as convenience. The corners and pole positions are reinforced for extra durability, and the sturdy one piece 13 oz. solid vinyl top resists fire and mildew. This canopy provides approximately 100 sq. ft. of covered space and includes all the necessary poles, stakes, and storage bags. The canopy looks very great! It covers most of the ground with shade. The foundation is stable and easy to install. Its great for outdoor use and preparation use in assembly.